What are the defining features of a culture of innovation? An environment that has the agility to respond to change and provides the psychological safety, process and tools to leverage the creative thinking needed to innovate: to produce, develop and implement ideas, so that economic and social value can be gained from knowledge to generate new or improved products, services or processes. This environment is a product of two things: the people in the organization—their leadership style, shared values, behaviours, attitudes, communication styles and working practices—and the infrastructure (e.g., policies, processes and systems). Innovation is a leading indicator of an organization’s ability to sustain success. And in today’s uncertain and complex global business environment, being able to sustain success through a culture of innovation takes on increasing importance. A “culture of innovation” gives you a competitive advantage. An organization’s culture is visible to employees and to customers. The stories employees and customers tell about your organization will give you a hint about its culture. It’s important to understand that an organization is a system. At its core are individuals, who comprise teams, who then comprise the organization. If you impact the individual, you’ll impact the teams, who will then impact the organization. You have to have an impact on the parts before you impact the whole. The reverse is also true. Vision, strategy and direction set at the organizational level will impact teams and individuals. Culture comes from the top: the CEO and executive team are largely responsible for an organization’s culture. Their leadership style, values, behaviours and way of working set the tone for an organization’s culture. Thus, if an organization wants a culture of innovation, the leadership team must take the lead by setting their intention, communicating it to the wider organization, and demonstrating their commitment to innovation through their own behaviours and involvement in the process of achieving innovation. How do you set intention? By developing and implementing an innovation strategy to define innovation in your context and answer the questions about who, what, where, when, why, and how you will innovate. For more on setting intention, read our blog on How to Develop an Innovation Strategy. These steps are described in the following paragraphs. How and why to innovate will look different from one company to the next. Innovation is contextual, which means that while you may understand the importance of innovation, you need to create a shared understanding around what it is, what it looks like, and what it will do for your organization. Asking your teams “to be innovative” won’t get you there. Forming a shared and specific vision of what innovation means as you go about your daily work will. Innovation doesn’t have to be limited to revolutionary new technologies, products and services, like the computer, the cellphone or space travel. There is much to be gained from changes that provide value to your customers and employees. This is called incremental innovation. Responding to existing or anticipated change to keep your organization vital, viable, productive and relevant so you can benefit the people you serve and contribute to economic growth and prosperity in the places you operate. The intention of innovation is to make our lives better and easier. The outcome of innovation is measurable value for the organization and the economy. The reward is the sustainability of the organization. This is where having an innovation strategy comes in handy. The trick is to translate a general definition of what innovation is to what it specifically looks like and is intended to do in your organization. It’s got to be in plain language and it’s got to be relevant to everyone in the organization. An organizational culture that supports innovation is one that supports creativity—one where creativity is welcomed, can be expressed, and is accepted with respect. In the 1980s, Swedish researcher Goran Ekvall set out to discover what organizational conditions hampered or stimulated creativity and innovation. He found ten dimensions that impact the environment, represented in the diagram below. I put “work environment” ahead of “build innovation skills” in this list of four actions to take; small tweaks to the work environment help create the conditions for innovation skills such as creativity to flourishy. There’s no point in building innovation skills if the workplace is not conducive to people using them! To better support innovation, individuals and teams must be equipped with innovation skills. The challenge is, much of our educational training focuses on developing critical thinking skills and searching for the one right answer. To be innovative, we need to think and act differently, and to leverage creative thinking. Learn more about these four skillsets and how to assess and develop your innovation skills in our previous blog post, How to Develop Innovation Skills. The best way we’ve found to build innovation skills in organizations is by teaching the creative problem solving process (CPS) and engaging people in using the process to tackle innovation challenges. 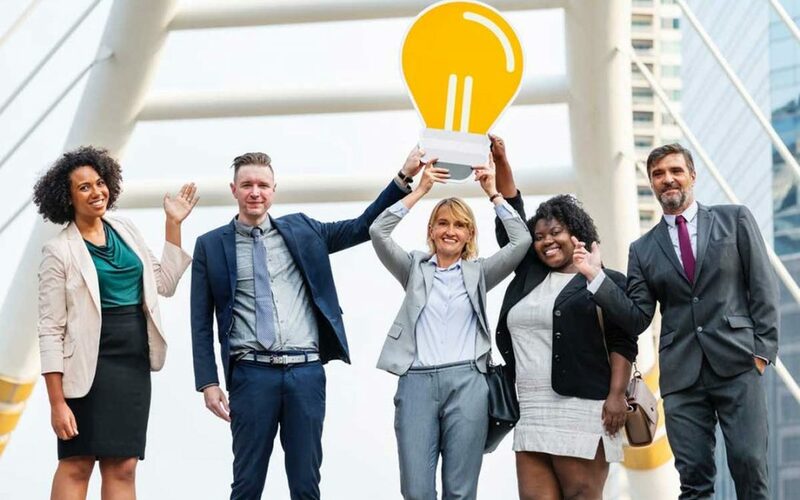 BridgePoint Effect teaches creative problem solving using the FourSight Creative Thinking System™ and teaches organizations how to engage people in the process of innovation through our ThinkUP Innovation Framework™ programs. Third-party research (2013, 2015) shows impact 6 – 18 months after training on creativity and innovation skills development. Research conducted by IBM (2007) shows that teams who have FourSight thinking preference awareness and process awareness outperform teams who don’t. It is easily accepted, adopted and implemented as a process for innovation – it makes innovation structural and language-based. 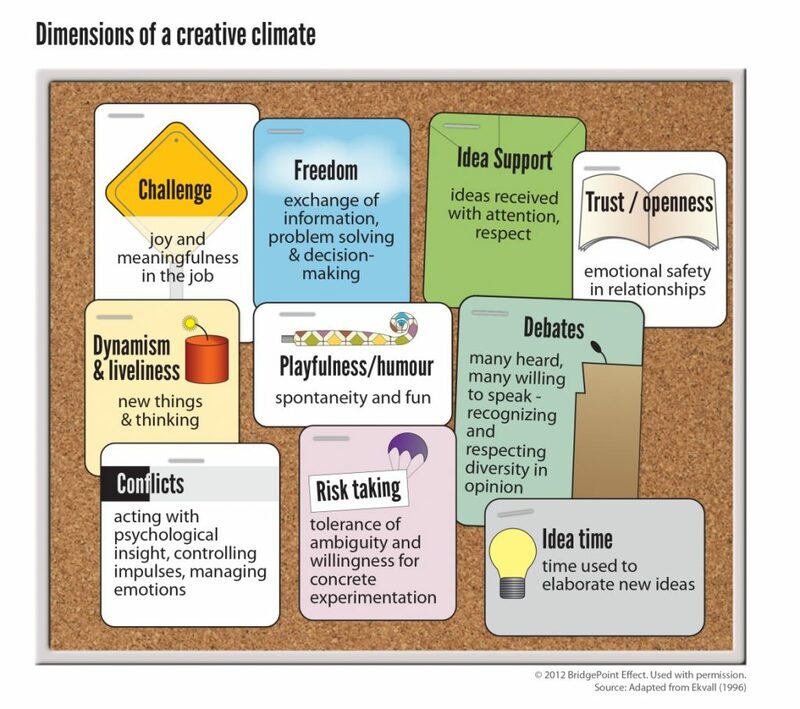 The assessment helps people understand how they are creative and how they can bring their best thinking to work. It plays well with others – you can use it with any business practice, with any other innovation protocols you may have already implemented, and to enhance organizational change and transformation effort. Learn more about our FourSight trainings here. Our ThinkUP Innovation Framework™ was developed because we know that innovation skills are built over time. This framework goes beyond the classroom and helps leaders and their teams build innovation skills within their own work context and on the job. Learn more about our ThinkUP Innovation Framework here. After implementing the previous three actions to become an organizational culture that supports innovation, we suggest measuring the impact. In any organizational effort, what gets measured gets done. Measures are important. They remind us we’re working towards doing something of value, and they help us understand the progress we’re making in building a culture of innovation and achieving innovation outcomes. Like innovation, how you measure it is contextual. I’ve written about the challenges of measuring innovation and new research on more sensible measures in this blog post. If you’re investing in building innovation skills in your workforce and you’d like to measure how you’re doing on building an innovation culture, consider using the Organizational Growth Indicator (OGI). Evaluate the impact of their training and development efforts to support innovation. Learn more about the Organizational Growth Indicator here. The kind of organizational culture that supports innovation is a “culture of innovation.” Culture is simply the way we work. By changing the way you work so that you work more creatively and innovatively, you can become an organizational culture that supports innovation. An organization is the sum of its parts. Impact the individual and teams to impact the way you work in the organization. Culture, however, is set at the top. Thus, it’s important for the leadership team to set their intentions for culture change and innovation before you start, and to demonstrate their commitment to innovation through their own behaviours and involvement in the process of achieving innovation. BridgePoint Effect is an organizational development and innovation strategy firm that brings decisive navigation to achieving change and integrating innovation. We build innovation skill and capacity to future-proof your people and your organization. We do this through tireless creativity, forthright dialogue and a structured process so you make innovation happen. By Janice Francisco, CEO, Principal Innovation Consultant, Facilitator and Coach, BridgePoint Effect, and Chair and Advisor to the Conference Board of Canada’s Council on Commercialization and Innovation. Book a 30-minute consultation with me to discuss how your organization can better support innovation.